This year, our son Andrew will turn 20. Andrew was a little over two years old when he was diagnosed with autism, and it’s fair to say that we had no idea what life had in store for him, or for us. Fast forward to today, and two things are clear; we are proud of the young man he is growing into and we’re proud of the early intervention service he inspired us to establish. I’ll be tackling the Chain Reaction challenge for a third year this month, which includes seven peaks over seven days. 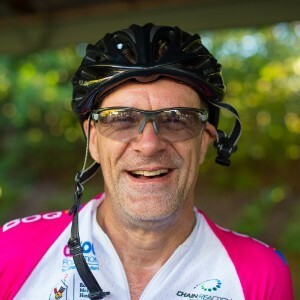 I’m part of the Hutchinson AEIOU Team, and will pedal just over 1,000km from Canberra to Melbourne in his honour, and also for the hundreds of children we support at AEIOU. Each team member pays a registration fee to cover transport (including flights) and also pays for any training costs, which means this is a financially responsible event where all funds directly support the children who need it. Autism is life-long, but early intervention is life-changing. Our goal is to support this generation of young children, helping them to learn the skills they need to make sense of their world and participate in it. At AEIOU, our specialist staff support these children and their families in the most crucial years of their development. We are always looking to see how we can improve our service, reach more children and support more families. One of the ways we plan to do this is by constructing a new centre in Springfield. The funds raised from the Chain Reaction ride will assist with the fit-out of the new centre, which will replace our current service in Camira. The new centre will nearly double our capacity for enrolments, and allow us to embrace cutting-edge technology to optimise outcomes for the next generation of children. There’s an enormous need for this centre in Springfield, which is a rapidly growing area. If you can help, please click this link. You can also follow us on the AEIOU Facebook page or the Chain Reaction Facebook page during this enormous ride. Wish me luck! Have Fun, ride safe mate. Go well James. Enjoy and stay safe. Your an inspiration to us all. Keep up the great work and good luck for the ride. You are a superstar, mate ... and never forget rule #6 - 'free your mind and your legs will follow" and rule #9 "if you are riding in bad weather, it means you are a badass. Period"... Kudos and well done. Good luck James. Thank you for your hard work in finding the right home for children with autism to be welcomed, supported and thrive. My amazing nephew Zachary is a graduate from AEIOU. Great work! Enjoy the ride.